I just finished my first Fast Luck bath and I think I spent more time playing with the pyrite grit at the bottom of my tub than praying. I don't know why I'm so tickled by there being pyrite in the bath crystals but I LOVE it. I managed to pick some of the grit out and put it in my money sweetening honey jar. I just love they put so much into their products instead of just some salts, dye and oils. Thanks for the kind endorsement. We do make out products with a lot of care and love, strong magical ingredients, powerful intentions, and -- always -- our prayers for your success. The way you picked up the pyrite and used it is EXACTLY right! That's what it's there for. I use muslin bags for baths, which makes it easier to save the herbs. Also keeps my bathtub drain from clogging. I understand that this may not be the most traditional way to use them, but I have some fast luck bath crystals on hand and was wondering if I could make a lucky hand wash with them for playing scratch offs. I figured I could make them last longer that way. Of course, if it would be better to use them for an actual bath, dressing my clothes, or making a floor wash, I will do one of those things instead. I just enjoy figuring out new ways to use products, and this seemed like a good idea to me. I like the idea of using the bath crystals as a hand wash. They also sell a herb mix, Gambler's Gold Lucky Seven Hand Wash, http://www.herb-magic.com/gamblers-gold-one.html . And don't worry abut the double-posting. We were having some technical problems on the forum but I believe that Nagasiva got it fixed. 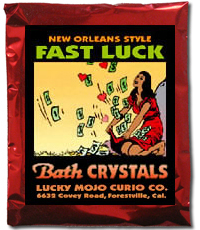 veggiekiller420 wrote: I understand that this may not be the most traditional way to use them, but I have some fast luck bath crystals on hand and was wondering if I could make a lucky hand wash with them for playing scratch offs. I figured I could make them last longer that way. Of course, if it would be better to use them for an actual bath, dressing my clothes, or making a floor wash, I will do one of those things instead. I just enjoy figuring out new ways to use products, and this seemed like a good idea to me. Thanks, Miss Aida! By the way, I really enjoyed you as last week's guest on the LM radio show! Fast Lucky is one of my favorite oils as well. I have not performed the full spell, but use the oils frequently, when the feeling hits me. Good luck with your work Miss_Liz.